Lucidity is a boxer rescue. She is a deaf dog, trained in ASL- sign command. She can come, sit, stay, lay down, walk, and many other things any other normal dog can do. You can even tell her she is a "good girl" and she understands. She is a very sweet girl and loves people and attention. Many dogs come to Diamond in the Ruff with special disabilities. All they need is someone to take the time to work with them and teach them everything they need to live normal and happy lives. 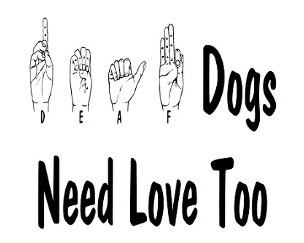 Diamond has taught many deaf dogs how to understand sign command and have successfully placed them in loving homes. Special needs animals have unrelenting unconditional love to give and so much to teach us. Lucidity is a special girl and, with our love and rehabilitation, has finally found a forever home!